FIT FOR A KING, who released the sonically harrowing Deathgrip through Solid State Records this past Fall, are headed back out on tour. 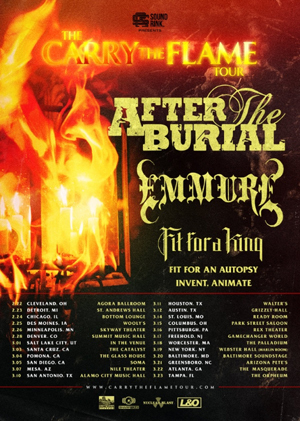 The band will join AFTER THE BURIAL, EMMURE, FIT FOR AN AUTOPSY, and INVENT, ANIMATE for the "Carry The Flame" tour. The tour launches on February 22 in Cleveland and runs through March 23 in Tampa.